Water charges: Don't panic, don't pay! Earlier in the Dail today during Leaders Questions Taoiseach Enda Kenny told Anti-Austerity Alliance TDs Paul Murphy and Ruth Coppinger to ‘toddle along’ to an Irish Water briefing in the Dail if they wanted to know the payment figures on the 500,000 bills due as he would not ‘spoon feed’ them the information. After attending the briefing, Paul Murphy & Ruth Coppinger held a press conference on the plinth of the Dail. Paul Murphy TD said “At the Irish Water briefing this afternoon, which we toddled along to on Enda Kenny’s advice to get the payment figures of bills due to date, we were told by them that it ‘would not be helpful to give payment figures now’. The question is who would it not be helpful to? “I would suspect that they are not releasing the figures because there is a mass boycott of the bills taking place and they do not want to encourage people to join that boycott. 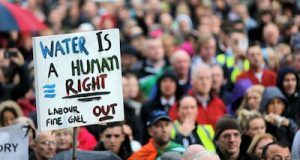 From the Taoiseach’s reaction in the Dail today the government seemed rattled because Irish Water is sinking. Ruth Coppinger TD said “Today in the Dail when I asked Enda Kenny ‘what is the point in Leaders Questions?’ after his refusal to answer questions, he told me that they were to ‘tell me where to go’. This ignorant reaction from the Taoiseach shows he is under pressure. 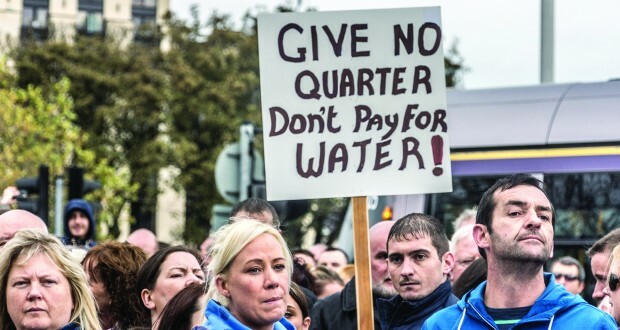 “His government are continuing to blunder along with Irish Water. The ‘silver bullet’ which was to be the new legislation is just another part of the mess. If this legislation ever happens, people have nothing to fear, it does not change anything, there will be no penalties until after the next General Election by which point a boycott can have forced the next government to abolish the charges.